I finally finished a little fun project I have been working on all year. I made my own cookbook. I decided, earlier this year, that I needed a little boost to get out of a cooking rut I was in. I knew what I needed was a project that would help my organize and simplify my recipes. I decided to collect my family favorite recipes and consolidate them into a cookbook that I would really use...not like those cookbooks that I buy that have one or two or three good recipes in them, but a cookbook where I would use ALL the recipes often. How many times can I type the word cookbook? Anyways, I knew that when it comes to me and projects and being the mother of five children, I have to break everything down into little steps. First I organized my recipe binder nicely. I took out recipes that I would never make and marked the one I knew already were going to make the cut into the book. Then I slowly but surely started trying some new things. This is what really got me out of that rut...I was making the same things over and over and I knew I wanted a nice collection of 100+ recipes, and I only had a little more than half of that of die-hard favorites so far. I found recipes through friends, family, blogs, and books and recipe site. I experimented on my children and if the recipe was a majority-rules good one, I would make adjustments (more sauce, a little less spicy etc) to make it our own. If one didn't work out, I pitched the recipe and tried something new. We mixed things up and tried things again and again. I have to say-it was fun! Once I felt like I was ready, I opened a Blurb account (I chose this company to make the cookbook just because I heard they did a very nice job with the photo aspect and made it all easy-there are probably many good choices out there I am sure) and watched one quick tutorial on how to make a book. I looked at some samples of recipe books already made and decided, of course, I wanted it to be very simple with full page pictures. I downloaded the software and went to work, slowly but surely, entering recipes a little at a time...remember I just finished this and I started it in the beginning of the year. They have easy recipe templates. Lots of choices of course, but I don't like lots of choices so I kept my blinders on and just went with the easy and quick templates. I did have some food photos, and I had planned to have one for each recipe, but I decided that was just too time-consuming so I used some of my favorite family pictures throughout. For the cover and the divider pages, I made a quick collage in Picasa and used that as my image. I proofread, hit send, and chose what type of cover I wanted before ordering. I would have loved to have a jacket, but I think for a cookbook that I'd be using everyday, I would have just ended up removing it anyways. I was so excited when I got the email that it shipped that I stood outside waiting for 2 days and nights till it was delivered. Not really but I wanted to. I love it. The one drawback is that it is not super cheap...the cost depends on how many pages and what sort of cover you choose. My book was around $65 I think-I used a coupon I found online. To me it is worth every penny because I have a scrapbook type of cookbook that will be a family treasure. P.S. You can find some of the recipes right now on Cooking On Clover Lane. 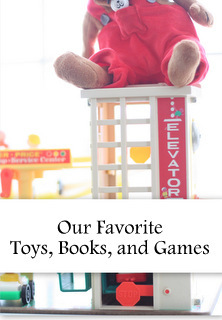 Here's a list of our favorite, most-played with, delivered-to-your-doorstep, Mom-approved toys. By age and interest here. Sarah! It's gorgeous! I love it! Beautiful! I love it. (You always do such amazing creative things....such an inspiration). I love this idea! Yours turned out beautifully. Love, love, love! What a fabulous idea. I too have a hug ring-binder. And now I have another project on my list. Eeek! That is just plain awesome. What a treasure for your kids! That is so cool! I want one! I should do something like that with my menu plans. I have about 14 weeks worth so far with recipes and grocery lists. My mother in law made what I refer to as "the black book" for all us kids one year for Christmas. We all submitted our favorite recipes and she divided them into categories and included family photos too. It's a great book and I still refer to it often but I only use about a quarter of the recipes. It would be fun to make one of my own. Thanks for sharing! What a gift for your kids someday. What a fantastic idea!!!! And priceless, for sure. Love this idea! I have a binder similar to yours. Had never thought to put an actual book together. My oldest is always asking me for recipes (she is finishing up college) and the younger one will head off next year. This would be a great gift for both of them!! How ABSOLUTELY adorable! Congrats on getting it completed and what a beautiful cookbook you will ALWAYS enjoy opening and cooking from! Sooo cool! The only problem is-your kids are going to fight over who gets it in 50 or so years : ) might have to make 4 more... Love the family photos throughout, a very personal fun touch. You could probably market the digital version and we could all order our own with your recipes and our photos..... Hmmm... I see a profit for you and a benefit for all of us out in cyberville! I've been doing the same thing with my recipes. Only my finished project looks more like your binder that you started with. Yours looks amazing and beautiful. You are the most organized blogger I read! Good job - something I have put in my notebook to do but you have actually done it! Well done, it looks great and how wonderful to hand down to your children. Wow, that's great! I too have a big binder stuffed to overflowing. Hubby's aunt gave it to us when we got married and included favorite family dishes and I added recipes culled from magazines over the years. Your book would make a fabulous gift for newlyweds in your family. hope the college search is going well...what a journey it is. Now that is a whole other book!! I have a handwritten book that my grandmother and aunts put together for me. Since my grandmother passed away, my younger cousins never got the same family heirloom, and I've been thinking about replicating mine for them somehow. This would be a wonderful gift for them, and maybe even for my Mom. That's awesome! Love to get one. Your book is amazing! I made a similar cookbook for my mom for Christmas a few years back. I made it on Tastebook (have you heard of them?). The nice part is that she can add new favorites and have the pages sent to her to add into her book. Now I just need to get my act together and make myself one! That is one of the coolest things I've ever seen! I love the pictures in it! I would totally buy your cookbook. Just sayin. Oh My Goodness... I LOVE THIS IDEA! If I only loved to cook, LOL! Your book looks beautiful! Love it so so so much!! It's so personal and family and special. I have a feeling you'll be ordering duplicates, cause your kids are going to want one when they leave home. Thanks for sharing!! Wow Sarah! I love your cookbook. What a wonderful & creative thing to do. Once I get more recipes down on my blog, I think I might just make my own cookbook. What a great gift for your family. You can now have a "real" family cookbook to pass on to your kids when they move on and leave the house instead of coffee/food stained recipe cards. Amazing! Do you know how much it costs to make copies? I am sure its less, right? If so, what a great Christmas gift for friends and family. You rock Sarah! You have so much creative energy! I love it! What are you going to come up with next? What a FABULOUS idea! Thanks for the wonderful idea! I may just try that! I just wanted to thank you for all the book recommendations on your side bar. My house has never been dirtier but my mind is alive! Passing on my favorites to some of my reading buddies. What a feast for the eyes as well as the stomach!! The last thing I need right now is another project, but this one just might be soooo worth it!!! I am in love with your cookbook as well!!! I love how you took your time with it and did it right! Love it! 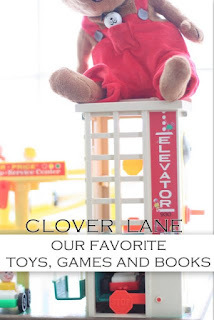 I also love, love your Cooking on Clover Lane blog. I have made many of the recipes and they are always easy and yummy. I hope you continue to post more over there! What a great idea! I love it and you have inspired me to do this too. I just have to remember that it took you one year. I am still trying to organize my photos which is not going so well. . .
What a fabulous idea! I very well may copy and make a cookbook too! Thank you for sharing your fantastic idea! This is amazing. Great idea. This truly is a treasure your family will enjoy for ages. WOW - i've never seen a personalized one before - I love it! You should get it published! If they are all like the PB cookie recipe I KNOW it's awesome! I make those ALL. THE. TIME. Can't wait to start using more of your recipes! WOW!!! This is one of the coolest things I have ever seen!!! I would love to have all my favorite recipes in a book like this instead of in a shoebox! I am so jealous and so inspired! I love it!!! I would absolutely buy it!!! I mean I would buy a copy of this cookbook!!! Soo amazing! Can I pay you to spend another year making me one! Thanks so much for sharing...I am inspired to do something similar! That is amazing! What a wonderful idea and super professional. Love it! Well, that's just the most beautiful thing I have ever seen!!!! 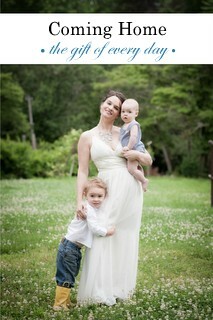 Thank you so for giving such wonderful inspirations in this wonderful experience of motherhood!!!! You are my hero!! Genius idea Sarah!! Now let's get this mass produced and sell it to all your followers!! What a wonderful keepsake for your family! That's a beautiful book! A warning about Blurb for anyone else considering it. I spent hours upon hours making a first year baby book on blurb.com for my neice, and since I didn't order it within 15 days of starting it, they deleted my entire book from my account. They gave me only 24 hours notice by email and I didn't see the email in time. Customer service has thus far refused to give me access to the book again. I will never again use blurb! Sorry to vent, your cookbook really does look wonderful. I have an old family (put together) cookbook from years and years ago.... done on a typewriter and photocopied. This would be a great way to update that cookbook with photos and all! Yours is so professional looking! Hands down, the coolest thing I've seen in a long time! I'm so glad you posted this. I've been looking to turn my cookbook binder into a real one for a year or so, but haven't really known who to go to. That is so awesome! Added your cooking blog to my roll. Can not wait to check it out! LOVE LOVE LOVE THIS!!! I have been thinking of doing this for a long time and seeing how beautiful yours turned out might just be my inspiration! Beautiful Sarah. What a treasure! Looks like a beautiful family cookbook! I'm excited to try some of your recipes! This is the BEST idea I have seen in a long time. What a wonderful keepsake for your family! I may have to copy this idea. Wow! Awesome! Makes me want to create one too! We have the same three ring type binder book with school dividers in it right now. So inspiring! how fun! what a great idea and a great way to preserve all those memories. brilliant! Love it! Love it! Love it! I just started the binder phase with my recipes so that I could eventually do what you just did! Glad to see it worked out awesome! Great minds think alike! I absolutely love this idea! I wish I would have known thought about it earlier. My husband and I love to cook and I think this would be a great Christmas present, but since it has taken since the beginning of the year, no way I could do for Christmas huh? Wish I could find a way to pull it off. Wow. That is beautiful. Are you selling them? I'm only kidding but you did a beautiful job. I would love to reorganize my recipe notebook. I'm just afraid a bound book would limit what I could do later. I like the flexibility of a notebook, but then again your book is so beautiful. Oh my goodness!!! I want this so much!!!!!! THAT is awesome!!! I think it is absolutely worth the price. I love how you were creative with the pictures in relation to the recipe. Wow, Sarah, that is really gorgeous. It is very special and I think it was totally worth every penny as well. Can you get more copies to pass on to your kids when they grow up and move on? Gorgeous! I've been talking about making one for a long time now... maybe this will motivate me to actually do it. Thanks for sharing. My extended family did this one year and now I have a cookbook full of family favorites. We scanned actual recipe cards written in family member's handwriting and that has made it SO special to look at and use. Love yours!!!! Oh my goodness...this cookbook looks so gorgeous!! I love this idea so much - thanks for sharing! Sarah - this is unbelievably beautiful! You need to sell it and I would be first in line. You are so VELLY VELLY SMAWT. I love it, and have worked on a similar book on blog2print. I am glad to hear who you used because I needed an easier template to use, and I like that you can work on this project over time. This is the coolest thing ever! I'm so glad you did that for yourself. Great idea! Love this idea! My mom has been talking about doing something like this, but didn't quite know how to go about it. I am in love with this cookbook. IN LOVE! What a wonderful idea! Thank you for sharing....Maybe I'll have my own cookbook to show off next year! that is absolutely beautiful-what a wonderful heirloom, too! I have wanted to do the same thing. I"m tired of keeping 5 or six cookbooks--with only 3-5 good recipes in each, and then having to rifle through the hand written or printed recipes I use, too. I'm glad someone else did it first and was the guinea pig. I'll make that my 2012 project. That is great! I have been meaning to make my own this year. One of 3 resolutions I did not do yet. I am making 1 new recipe a week. I may have to try some of yours! Oh my gosh - this is amazing! Love it!!! I printed out my blog with them and it worked great. Now I've got to do the cookbook. It's excellent! awesome idea...i would LOVE to do this or have on given to me as a gift. it would be a great wedding idea!!! by the way, i love ur blog...i live in a nearby town of yours and if i would ever see u around, it would be like a celebrity sighting!! Oh my goodness!!! I absolutely LOVE this. SInce staring my blog, I've found that the posts and photos I most enjoy are my food ones and this is the PERFECT way to capture it in a non virtual manner. Soo love this, thanks for sharing! Love it! It will indeed be a family treasure, and you figure--buying half a dozen cookbooks with only a handful of recipes that you actually use will cost you more in the long run! I LOVE THIS IDEA! I've actually been following your blog for a couple of years now and I think this is the first time I've ever posted anything....which seems a bit stalker-ish creepy to me, but I promise I'm not creepy! Your helpful offerings on motherhood and housekeeping have been a HUGE blessing to our entire family and a great motivator for me (I finally have a cleaning plan for once in my life!). Thank you so much for your commitment to blogging! Hopefully, I'll get my own blog back in the swing of things soon. wow! a brand new family heirloom! Beautiful Cookbook! Did you start with a cookbook template or did you start from scratch? You never cease to amaze me! That is such an excellent idea ... I am going to steal it at some point. :) Such a great memory! Okay now I have to start one of my own. I have been trying to come up with some neat way to oganize my recipes and you have inspired me. I will do this! Your book is so pretty and personal to you and that is what I was looking for. Now it will probably take me a year to add to my receipts and take pics. But it will be fun. Thanks for the idea! What a fabulous idea! One your kids will be able to treasure forever. That is such a special gift for yourself and your family. I think I'd order one more....one that can get bent and food splattered when you use it and one to stay pristine. Would you recommend BLURB for taking a blog and printing it up into a book? One reason why I do a family blog is to do just that...since I don't have time to scrapbook and keep in touch with family and friends. Would you recommend BLURB? Thank YOU! I love your blog and check in quite often. basically, to mirror everyone else- you're a complete genius and this is a fabulous idea. i love making mini-books and photo books- and this...well it just revolutionized my current way of thinking! muchas gracias and keep on cooking lady! this is fab! I have been working on a blurb cookbook all year too. Your creation is gorgeous. I love the font you used. What font is that? Shared link on facebook because i think your cookbook is an inspired idea. I am planning to replicate it s my project for 2012. Thank you for the inspiration, your book looks fantastic!! You are one "together" lady..very admirable and an inspiration to my newly pregnant daughter. I sent her your blog address. Thanks for sharing. Oh my. This is magnificent and now I want one too. What a great idea for housing memories. Wishing it was for sale!!! Especially after I read that you stopped eating meat in March and sugar and white flour. I just started that and am so, so, so at a loss as to what to fix. I am in a rut and feeling like it is not going to last very long if I can't find some variety! Your book is beautiful!!! I absolutely LOVE this idea!! What a wonderful keepsake. It's beautiful and so inspiring. Maybe that will be my project for 2012-13 (because it will probably take me that long). Can you tell me how you got the "ribbon" on the cover of your Blurb book? I have been trying to figure out how to color in the text box in front of my pictures on a Blurb book I'm working on and cannot figure it out, I basically want a ribbon across it like the cover of yours. I can't find a color that looks good on top of the photo but can't figure out how to color it in. Did you use the Easy-to-Use Templates or did you opt for More Customization?? I'm totally interested in making my own book, of some sort... recipes... family... etc. Thanks! Your's turned out great! AWESOME! I love it. I'll be back to get more info. on this soon! Oh lovely! This is exactly what I am working on, too...for all the same reasons! Found you through Pinterest and I think this might be my Christmas present for myself this year. A GREAT idea. I love this and you've inspired me, so I just wanted to send a quick note to tell you so. Plus, LOVE your little chickadee photo. How precious. Not that a stranger's opinion should matter much, but I have the feeling that every single penny of these $65 was well spent. Your project was a wonderful idea to begin with, and the outcome is just stunning, based on the few photos you put here! Thank you for the inspiration... and the how-to!! I really love this idea, its great and looks lovely! I think I will try to do this ready for next Christmas! Such a great idea. Wonderful gift and keepsake. Wonderful! 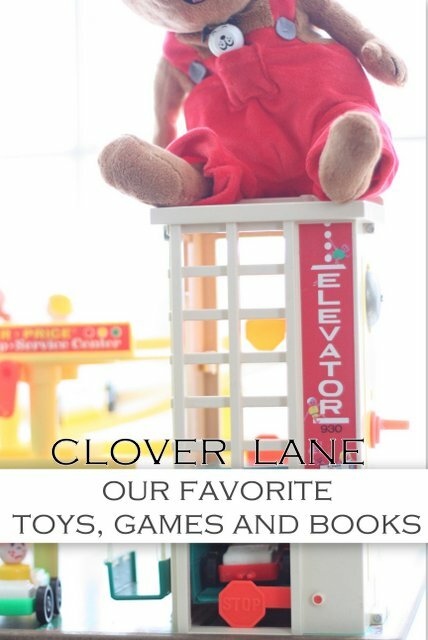 would you share the font on the front of the book you used for clover lane? Absolutely beautiful and an inspiration for the yellow house. wow - this is beautiful! Such a great idea! I'm gonna make one for my mom for Christmas! You're so creative! I love this idea! I want to make one for a family Christmas gift. Aww!Thanks for sharing! You may have already answered what i'm going to ask and I just didn't see it but what company did you order from. I love this idea!!! LOVE THIS! I have a recipe binder just dying to be converted into a cookbook like this one! This is so awesome! I had decided to make each of my children their own recipie box full of our favorite ones but I LOVE the idea of our own famil cookbook! Great idea! Thank you for sharing! I take lots of photos of so illustrating it wouldn't be a problem for me and I even have a program that figures out the nutritional information for my own personal recipies so I could do that too! So excited now. Thank you so so much! Oh I absolutely looooove this idea! This is wonderful! I start my book today! Thank you for such a special idea! What an awesome idea! I can't wait to get started on my own recipe book. Thanks! I love your site! One of the things I do is help others create their personal storybooks, genealogy family histories, yes recipe cookbooks, magazines, canvas, posters etc. I am a personal publishing consultant. Check out my site; create your free acct and start browsing all the templates! You can scan all your written recipes to a jpeg upload to your own online (secure) studio into a blank (or selected template) change it to fit your style! Then professionally publish your project (with as many copies you need) ! Very competitive prices, incredible quality! Let me know if I can help! www.HistoriesOfTheHeart.com is my site that takes you to Heritage Makers! There are tons go tutorials to get you started as well as me to help you! Feel free to email me if any questions! You have such great ideas! I love your blog! One of the things I do is help others publish their own genealogy storybooks, canvas, (recipe books). You can scan your recipes into a jpegfile, upload into your own studio where you have 80,000 prices of digital artwork and several thousand Templars to choose fron! It also allows you to customize your projects even when using templates! Go to my site and login for a free acct www.historiesoftheheart.com or email me lisa@historiesoftheheart.com for more help! Happy creating! I have 2 teenagers graduating this year and had already thought of making a favorites recipes book to give them when they eventually move out. I was thinking of doing a coil bound-type book you can get made up at the local office supply store, but yours is so much better! Though it may be more expensive to do it your way, it's very well done, nice to look and a wonderful way to send them off with something meaningful and full of memories from growing up. It's something worthwhile to pass on to their kids! Thanks for sharing! This is absolutely amazing. I can't wait to do something like this. It's absolutely beautiful! Love it! I have a couple questions I am hoping you can answer. What size book did you order and, would you change it if you could? How many actual pages did you end up with to include 100 recipes? Finally, do they charge you the same price for a page of photos or a page of text? I'm ready to get started just wondering about these few things. Thanks so much! I absolutely love this!!! What great idea!! I have lots of recipes, and this is would be a great way to save them all in one place and share with family. Did you copyright yours? I have been wanting to make a family favorites cookbook for a long time now. I do want something in a binder format though, that can be updated yearly, as the family discovers new favorites. Any suggestions? I made one once using Shutterfly. I love mine but with offer I had, It didn't allow me many pages. I want to do another one for my Daughter that just moved out. Im gonna have to check this out. Thanks for sharing. YOurs is awesome!!! I also recommend checking out Copy Me That http://www.copymethat.com/cookbook/ I like that there is nothing to download. It's an online cookbook designer. Hi I know this is an old post, but did you use good quality photos for this book or just ones you snapped on your phone? I am trying to make a blurb cookbook and it says all of my phone photos aren't good quality. I'm just wondering if it will make a big difference and they will all turn out blurry once printed, or not really? Thanks! Hi Kaity-It will probably make a difference-they have to be a certain size I think. I used them all from my good camera, not from my phone. Hi Amaris! Mine is 8x10.